So if you remember my story from January 8th of this year....the one with the dog escaping on my first day to meet Husky Haven volunteers...that dog was Tango. So now I'll tell a bit of his story. After they finally had him back to the house I found out that he had a dad, Randy, but he was in Europe on assignment. It was one of those three months or maybe three years type of things, I know Randy was hoping for the shorter, but he asked our director if she could watch him. She said OK and he kind of became the house dog. Everyone knew him and he loved everyone!!!! He was the 80 pound lap dog!!! About a year went by and Tango was still having a great time at Pat's , when we got a phone call. 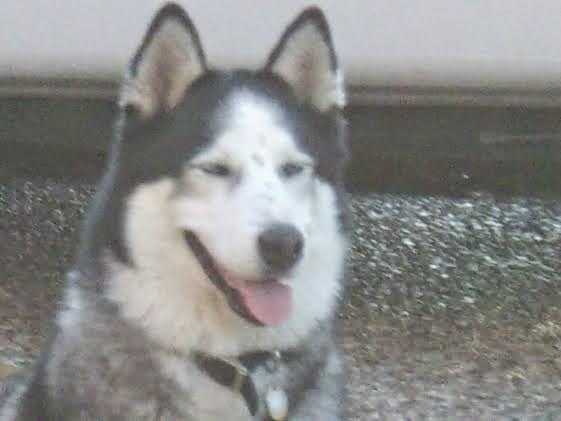 It was from the SPCA and they had found a Husky on the side of the road, shot in the face and left to die. Their problem, if we couldn't take her she would have to be put down. Pat decided she would have surgery....they had to remove part of her jaw, and leave the rest of the fragments next to her eye or she would lose it. When it came to her recuperation....she came to Pat's to get better.....we knew Tango wouldn't hurt her. I think it was love at first sight!!! He was fantastic with her and they became the best of friends.....40 pound Kaylene and 80 pound Tango. When Randy returned a couple of months later he couldn't break those two up so he adopted her and called her Mango. Mango and Tango!!! !I talked to him a few times after that and all was well. After a while I would ask our director how they were doing and everything was fine. Fast forward to November of last year. Randy contacted me, he had a three month assignment overseas and asked if I'd keep an eye on the dogs since they were in kennel. No problem!!!! I'd go at least once a week...they were so happy to see me...we'd walk and I'd spoil them with treats. My friend Greg was also there many days a week and he'd do the same. They reminded us of a married couple in the best possible way!!! Randy came in February to pick them up and I got consumed with this fundraiser.......till today. I was walking in Pat's kitchen to get some water before my next petsitting job, when the phone rang.....I couldn't get to it fast enough and it went to voicemail....Randy"I had to put Tango down this morning" click. I lost it right there....I think I cried for a half hour.....actually crying now. When I could compose myself I sent an email to Randy. He told me he had autoimmune issues and had started to fail yesterday. He had total liver and kidney failure this morning....and well you know. Tango was truly a dog all the volunteers loved. I know both Randy and Mango are hurting today and will be for awhile. Randy at least you can get a laugh knowing that Tango was the dog that almost scared me away from rescue!!! I know he is at the Rainbow Bridge feeling good right now with all his friends that have gone before him....he's probably playing with my kitty, Ash. Love to you Mango....we miss you Tango. Yikes....I hadn't realized it's been almost two weeks since I posted. Shame on me!!!! Today is not a Husky post.....it's about my sweet pittie boy Spencer. For those of you that have been reading my blog for awhile...I have mentioned Spencer several times. 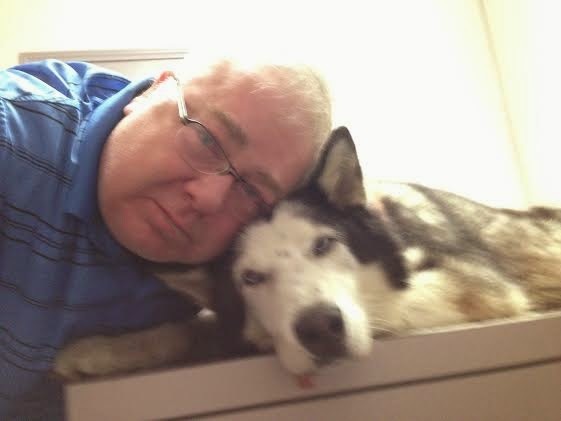 A couple of years ago we had some of our huskies in kennel and my friend Becks and I used to go and love on them and feed them treats every week. There were a lot of other rescue dogs too and we started doing the same with them. I completely fell in love with Spencer , and if I hadn't had so many dogs would have adopted him. When our huskies were finally out of kennel we still went every week to see all the other babies. Spencer looked forward to seeing us every week and I started working with him.....you know , sit , stay, that kind of stuff. 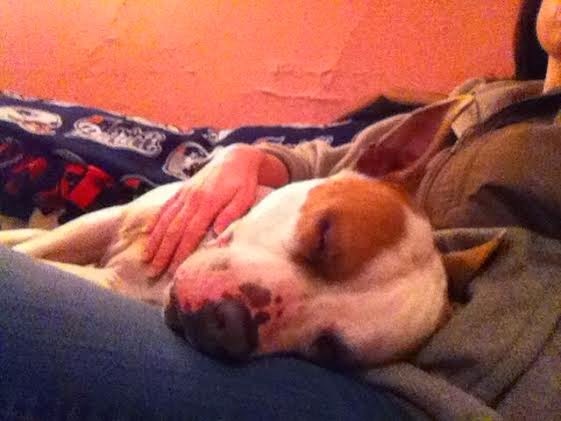 Time marches on and as of the end of last year Spencer had been in kennel for close to three years!!!!! Last year I met Greg and we started taking him to adoption events...hoping we could get him a great new home. Everyone loved him at the events....but no takers. At the beginning of the year Greg started networking with some groups that take dogs to new homes out of state. 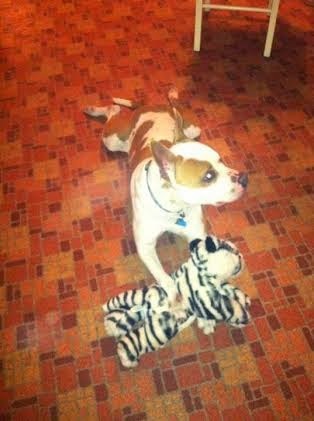 A woman in Massachusetts saw Spencer's picture online and adopted him right then!!! Greg told her he is a big boy, she didn't care, she had just lost a 100 lb. Malamute....and she wanted him!!! A few weeks ago he was part of a transport of 74 dogs coming from the south and going to new homes in the north. And today he was on the TODAY show.....it's just a really quick shot of him....I have the screen grab included....but so happy today. His name is now Teddy and he has a new life!!! Sometimes rescue is really hard....today that really brightened my day!!! I've included the link to the story, it's really incredible what this guy does every other weekend. And no, that's not my friend Greg. 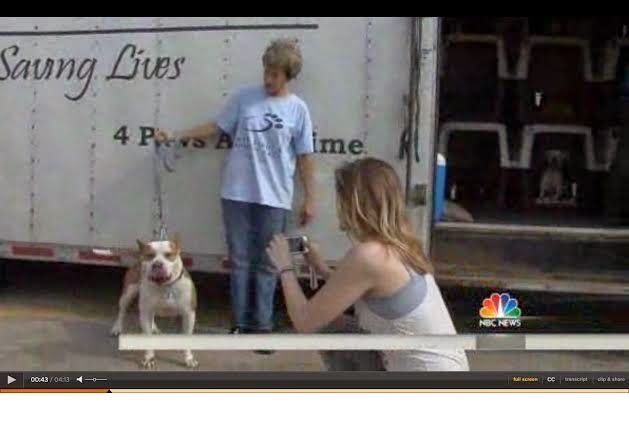 Please enjoy the story and see how people are making a difference in dogs lives. So yesterday BLD got his forever home!!!! He was being fostered by my friend Julia and her family for about three months and Saturday they made it official. If you've been reading my blog for awhile you know his story....that his leg was broken by a kick or a bat and he had a very long recuperation time along with two surgeries to get him walking again. He never once was in a bad mood, still loved people. I think he is going to be so happy!!!! What do you think??? About to go to his forever home!!! 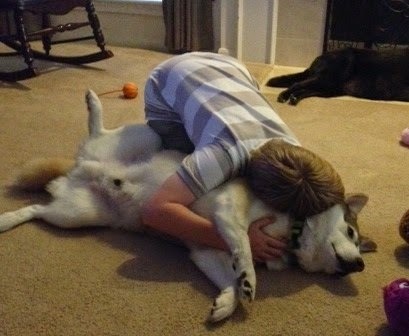 A boy and his dog!!!!! We spent a lot of time on that boy and I know that he and Nathan especially will have a wonderful time together. I know where you live so I'm gonna visit my boy every now and then!!!! We had another piece of good news yesterday. On of our adopters decided her boy was lonely so she came to pick a companion for him. Our director had me show her a couple of the girls, but from the beginning she was asking to see Bianca. So I showed her Bianca.....that was it!!! I should have done that from the beginning!!! Bianca and Zane got along really well...hopefully she will love her and adopt....we shall see!!! Be on your best behavior Bianca!!! I like good news days!!!! We had a great time last Friday!!! Unfortunately I screwed up big time. Thursday night I thought I put my camera in my bag, my phone camera doesn't work, but I left it at home....so I don't have any pics of the day to post here....you could have seen us in our ton of TV make-up!!!! I will have the feed of the show next month so I will post it here. Daddy-O and Iniki were the most fabulous dogs.....not one single problem from them either up or back...and they were perfect on TV, they get to go with us everywhere, just kidding. I hope we got the info out...it was important. That was a super long day...thanks so much to Denise for driving. I do have some pics of our event last Sunday. We were invited to go to a new Unleashed, these are smaller stores owned by Petco....they have many of the same things, but also have a bathing area for your dogs.We had a good time there....we will go back anytime. Daddy-O got to go for another outing, and Becky brought Gunter. Angelica also brought Harvey and Ulla from In the Name of Zoey. I hope to get at least a couple of volunteers and also hoping for some adoptions.....we shall see!!!! I also wanted to put a picture of the poster for the event we are having on May 3rd. If you are in Houston we will be at Winston's on Washington that night for a fundraiser.....come by and see us!!! I'm a little bit nervous. My friend Denise, along with Iniki and Daddy-O will be going to Dallas tomorrow to be on the TV show 'For the Love of Dogs'. I haven't been on TV for many years....I was younger, prettier and thinner!!! But this time I will be able to talk about my passion....rescue. Wish us luck....I'm happy to have the opportunity to talk about Husky Haven to a wider audience. If the interview is good I should be able to hook it up with my blog....we'll see!!! Have a great day.....talk to you soon!! !